In short: A powerful, tech-stuffed and safe mid-size luxury sedan. "If it ain’t broke, don’t fix it,” applies to messing with a good thing. Usually. 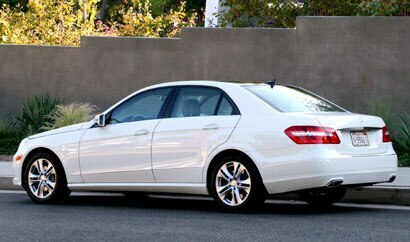 However, when Mercedes-Benz created their ninth-generation E-class models for 2010, they managed to take that proverbial good thing to new heights. Building upon a long history, this aerodynamic E550 sedan is marked by angles and chiseled motion lines, giving it a distinctively masculine appearance. In addition to its conservative panache, this mid-sized executive sedan is stuffed with enough technology and safety accouterments to make even a mild luddite cry. The rear-wheel-driving E550, available in a luxury or sport trim, is equipped with a fun-loving 5.5-liter V8 engine that revs the four-door car from 0-60 mph in just 5.2 seconds. A stiff unibody chassis, all-wheel independent suspension with AIRMATIC, and optional all-wheel drive give this luxury vehicle the deft handling on the road to match its dynamic acceleration. Inside the E550’s cavernous cabin are a standard hand-polished wood trim, power sunroof, interior ambient lighting, heated and fourteen-way power-adjustable front seats, and multifunction leather steering wheel. Music lovers will enjoy the automobile’s eight-speaker AM/FM/WB radio with a six-disc DVD/CD changer. An auxiliary input jack (in the glovebox) and Bluetooth interface are also included. Standard to all E-class cars is the attention assist, a drowsiness-detection system that measures a driver’s steering behavior for signs of fatigue. If a sleepy driver is detected, the auto will activate a warning signal. This is, however, hardly the only unique safety feature on the E550. Available safety tech includes a night view assist plus with pedestrian detection; blind-spot assist; lane-keeping assist; adaptive headlights and automatic emergency braking. Other optional gizmos and accessories, all depending on the feature package, include a panoramic sunroof; rear-seat entertainment system; multi-contour driver’s seat with massage; navigation system; iPod/MP3 media interface; power rear sunshade; and a rearview camera. This X generation bread-and-butter model simply got better and certainly delivers more value than its outgoing sibling. 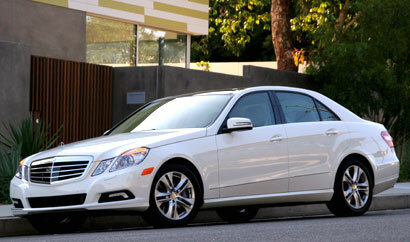 Our tester peaked at over $70,000, but you can get much of the same experience in the E350 sedan, which starts at $46,800. You get S-class amenities at a discount price. We’d drive this spacious, luxe ship to the office, the country estate, while taking the kids to school, and why not, for a road trip. We certainly felt secure in it. Congrats, Stuttgart!